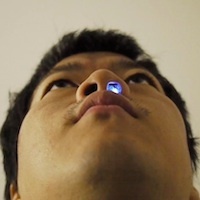 This device shows your nose breath with LED light in your nose hole. "eye-catching!funny!lose something! ".It is smallest nose breath sensor in the world.